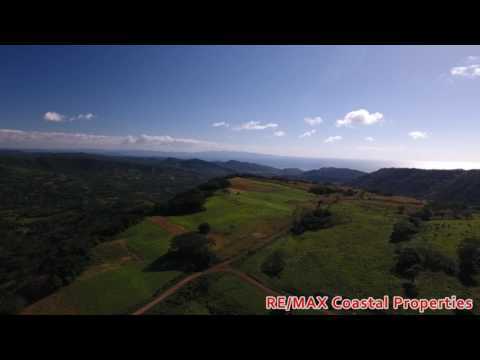 The Las Nubes Ocean View Farm is a must-see property located in the rolling hills just 8 kilometers South of the town of San Juan del Sur. This 13.5 manzana / 23.5 acre property sits high on top of a hill and boasts magnificent 360-degree views of the Pacific Ocean, the Lake of Nicaragua, Ometepe Island and the mountains of Costa Rica. This is a prime location for any type of venture – whether looking to build an eco-resort that utilizes the ample land for farming purposes or for the development of an ocean view community – the possibilities are endless for this beautiful piece of prime real estate. Large ocean view acreages like this one are hard to come by in this market and this Ocean View Farm is sure to go fast! You can get to the bustling town of San Juan del Sur in about 30 minutes and you have access to some world class surf a mere 20 minute drive from the property. This property is perfect for the investor that is looking for a private and secluded area that is still close to the area’s enticing attractions. This Ocean View Farm is located on top of one of the tallest hills in the area and boasts big views of the surrounding valleys and of the Pacific Ocean stretching off as far as the eye can see. With breathtaking views in all directions, proximity to Nicaragua’s beautiful flora and fauna, and easy access on a well-made dirt road that winds up to the top of the hill, you don’t want to miss the chance to see it for yourself! The property sits at a high altitude, giving it access to the great lake and sea breezes. The property, at any given time, is 5-10 degrees cooler than in-town and is an optimal place to harvest vegetables and other staples such as corn, beans, and rice. The farm is currently producing rice, beans, corn, squash, green beans. The current harvest is included in the asking price of this property! The property has a private road that runs the entire length of the property and the current owner is open to selling the land in parcels. Come and check out this great investment opportunity before it’s too late!